schoutbynacht | The greatest WordPress.com site in all the land! So I finally finished my copy of Jens Munk by Thorkild Hansen. It´s been sitting in our cabin for many years and I have been reading it on and off. It´s been taking its time not because it´s a bad book, on the contrary: it´s a great book. And that’s one reason why I wanted to write this little blog post. The book came out in 1965 and it also published in English – at least I think so! Thorkild Hansen has written a gripping biography of Jens Munk. He uses the device of introducing a narrator in the book, “the chronicler”, who represents the author himself. This allows him to write sentences like “at this point the chronicler imagines.. since sources are missing” and so on; a nice literary touch. Hansen creates a dramatic tension which runs through the entire book – the conflict between the noble families in Denmark and Munk himself, with the King Christian IV on the sideline. The King is the arbiter of power, but his room for manoeuvring is limited by the constraints of the nobility. Jens Munk has inherited his father´s conflict with the latter group, and this keeps blocking him from achieving the status in society which his actions should have gained for him. He plays a central role in many significant military and commercial events of his time, and travels from “Bahia de todos los Santos” in Brazil (Salvador) to the White Sea and to Hudson bay. The book itself is book-ended by the voyage to Hudson bay, starting with the scene in June 1620, Pentecost, when Jens writes his testament, finishing with the words “Hermed All verden god Nat og min Sjæl i Guds Haand” (with this good night to all the world and my soul in the hand of God). Of his crew of 64, 2 are left alive next to himself. Scurvy has killed the rest at their winter camp at the mouth of the Churchill river, in the southern part of Hudson bay. The three manage to float the smallest of the vessels, “Lamprenen”, and sail it to Bergen on the west coast of Norway, at that time part of the kingdom of Denmark-Norway. A feat reminiscent of Shackleton´s crossing of the South Atlantic from Elephant Island to the South Georgia Island (another great book – “Endurance”). The Hudson bay voyage is Munk´s main legacy, but Thorkild Hansen manages to spin a vivid and colourful story all along Munk´s lifeline, in the process giving light and sound and smell to Denmark and the many other places Munk visited in this lifetime. Scathing irony is reserved for the King and the nobility; sympathy goes to the common man who lives, dreams, suffers and dies. Looking back, it´s literally incredible what travel was possible in those days, though the cost in terms of human life was enormous. It´s also obvious that the limited equipment meant that sea travel almost exclusively took place in the summer half of the year. Finally, the ship “Scoubynacht” figures in this book, and that gave birth to the name of this blog. I Heggelikroken på Kolsås, der turstien begynner, der gartneriet i sin tid stod, går en bro over bekken. Vi ser den og undres over hva en slik vakker bro gjør akkurat her? Den leder fra en gruslagt plass inn på en velholdt plen i en privat hage, og er bygget med gamle jernbanesviller og et vakkert smijernsrekkverk. Broen er svært dekorativ, javel, men inviterer til en trafikk som det verken er grunnlag for eller ønske om! Den er en slags bro til ingensteds – har jeg tenkt. I dag snakket jeg med broens opphavsmann. Da hans datter var liten, for mer enn 40 år siden, bygget han den første broen for at hun lettere skulle kunne være sammen med gartnerens hjertesyke datter. Den opprinnelige broen var noe enklere, men fylte sin rolle. Den hjertesyke jenta døde på operasjonsbordet da hun var omlag 12 år gammel. En ny bro ble bygget noe senere; kanskje et flott smijernsrekkverk dukket opp hos en skraphandler og sådde frøet til nyskapningen. For den som kjenner dens historie står den der som et minnesmerke over gammelt vennskap . We travelled by train and stayed at the Zinkensdamm. This is a hostel of sorts located in a quiet part of Södermalm. No frills, no thrills, but well run and cheap. Perfect for us, and the nearest McFlurry was less than ten minutes away! I really enjoyed Skansen and the ABBA museum, for similar reasons: nostalgia, and down to earth Swedishness. ABBA has been part of my life since I was about 8 or 9, when “Mamma Mia” came out. “Knowing me Knowing you” was the soundtrack to my visits to Tromsø and the Kroken downhill slope with its lift that was forever breaking down and its poorly maintained “pistes”. The interviews with Annifrid and Agneta stood out. One self-possessed and sure of herself, the other much less so. I went back and looked at the photos. You can see it all the way. “Arrival”, “The Album” – I bought them myself, and “Fernando” on 45rpm, played it to bits. Last night I hooked the Mac to my old hifi and turned up the volume on Knowing me – knowing you from Spotify. Listen to the bass line – and not just on this one. Stockholm. Clean, tranquil, uncrowded, polite, cool, efficient, expensive. Imposing buildings, boulevards and squares. Not so cozy; not like Copenhagen, no, not at all. Here it made sense to hum “Baker Street” by Gerry Rafferty. The kids. They´re musicians. They don´t have fancy handbags and fancy clothes. And they are probably not the coolest kids in school. But they act like most kids – except as a group they are incredibly easy to manage. And then they have an ace up their sleeve. They unpack their instruments, a particular, focused light comes on in their eyes, and they become an orchestra. Gets me every time. Man kan virkelig si MYE om et loppemarked. La meg begynne med et sitat fra en middelaldrende svartkledd kvinne: “Vi er veldig glad i loppemarked. Jeg kommer hit hver gang, og bruker 2-3 tusen. Jeg får ikke så mye for de pengene på Storsenteret, og jeg har seks barn”. Det er interessant å se hvor godt en gjeng rutinerte – og hyggelige – korpsforeldre kan jobbe sammen med et minimum av instrukser fra sentralt hold. Det er som en maurtue. Hvert enkelt individ internaliserer sin vesle del av det store hele, og utfører de handlinger som skal til for å nå det felles målet. Subtile signaler fra dronningen styrer det hele på et ubevisst nivå. Og i helgen nådde vi et nytt maksimum av maurtue-het. Har det hele forandret seg på 10 år? Nei, ikke egentlig. Det var en jevnere etnisk fordeling denne gangen, og litt mindre pruting jevnt over. Det er litt færre platinablondiner som henger på armen til muskuløse menn med kort hår, litt lenger mellom de som virkelig MÅ på loppemarked. Og de samme gjengangerne og de som har loppis som en del av livsstilen, og som kanskje ikke har det så enkelt på alle vis. Prisnivået har steget svært lite på ti år, og fortjenesten er omtrent som den gangen. Vi har ikke blitt så rike at loppis er irrelevant, men senger og madrasser, som gikk før, de blir liggende. Summer holiday 2018 – fly to Lisboa and rent a house in Ulgueira. Here´s a brief report and some suggestions. We´re about an hour west of Lisboa, in the countryside in the tiniest of villages. The village is very very quiet, and immaculate. Many of the houses are summer residences, and the village seems almost deserted now in early July. 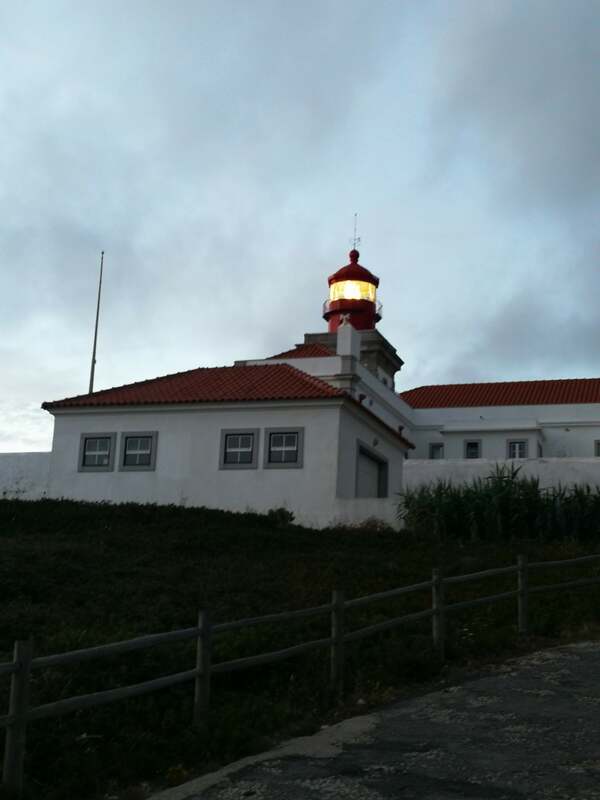 The whole area is very quiet, even the beaches, with the exception of the tourist attractions: Lisboa, Sintra, even Cabo de Roca, the westernmost point on the European continent. It´s walking distance from our house, so we walked there. In the photo above, it´s dusk and quite cold, but all the more scenic. The house is fabulous. Spacious, well kitted out, and made of beautiful materials. Just look at the tiled floor. We try out the different beaches. 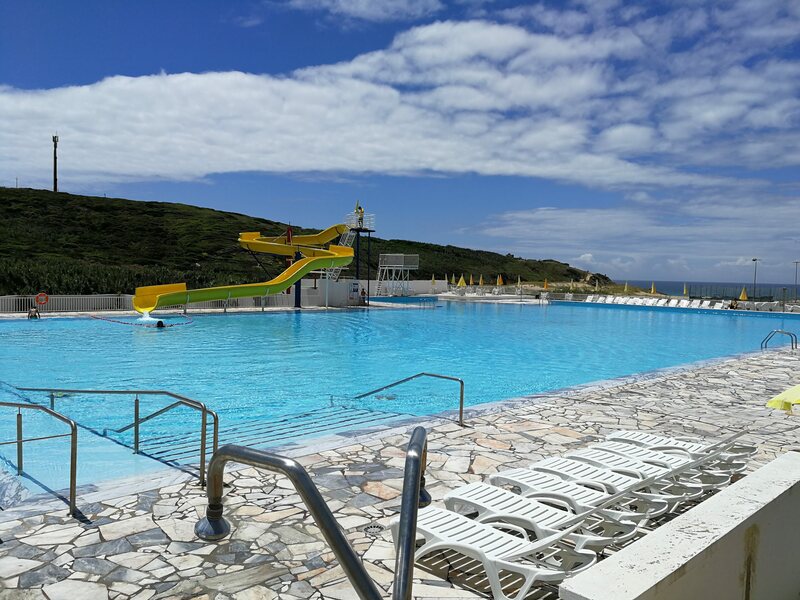 Praia das Macas has a large pool, seawater and all. We were about the only guests on this particular day! Praia do Guincho is “the best” and also wildest, and must be very crowded at peak season. When we were there, it was very roomy indeed. Sintra is very fascinating. It´s good to read up on it before going – we didn´t. It´s good to avoid walking up to the palaces, since there is a lot of traffic on the one-way lane. We walked up … a Tuk-Tuk might be a good choice. Also try the railway from Praia das Macas; it´s a museum piece, but it works. It´s worth taking a trip to the Santuário do Peninha, a few kms away from Ulgueira. The view from up there is excellent. Food. In Malveira there is a well-stocked Spar supermarket, it has all you need, and a pharmacy across the road. 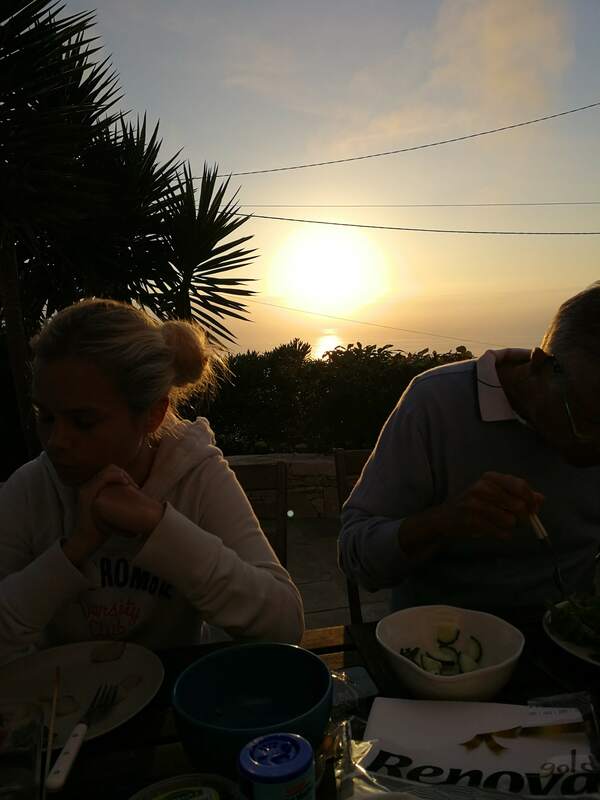 As for restaurants, we tried Tamariz in Estoril – very erratic service, but lovely spot, and very stylish. At the opposite end of the scale, Sisudo in Almocageme. Highly recommended. Same goes for Adega do Coelho. Very authentic. Do walk towards the beach and clifftops. Just go straight ahead and you can´t really miss it. The scenery is magnificent, and the sheer drops vertigo-inducing. Small kids – best held by the hand. 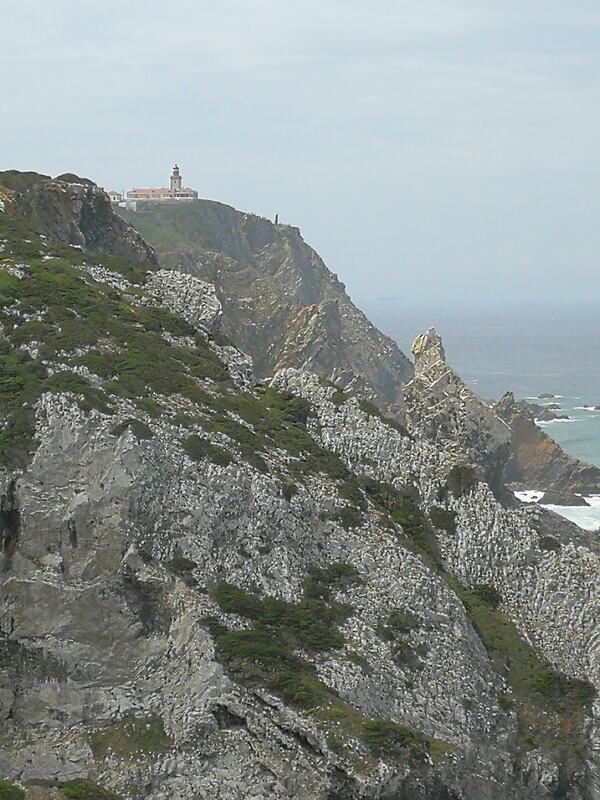 We saw a fisherman fishing directly from the cliff-top into the sea 100 metres below. And finally, the Portuguese. Very very friendly and excellent English. Hats off. Kader krysser hele byen fra øst til vest på banen. Utenfor står trærne mai-grønne. På Bekkestua går han av. Sender SMS-en, og noen minutter senere stopper Audien rett bortenfor. Kader hopper inn, og de ruller mykt avsted. “har du med deg”? Selvsagt. De kjører noen minutter. Russebussen står på en gårdsplass. Bassen dunker, pappaguttene henger, sitter og ligger. Kader går rett inn i bussen, og rett etter går han ut igjen. I lommelykten fra Clahs Olsson som han har gitt fra seg er det kokain for 5 lapper. Han er lettet. Nå er det i orden, gutta har ikke mer på ham nå. To dager senere er pistolen hans. Med de siste 5 har han nok til å handle. Albaneren som kjenner noen som kjenner noen har gjemt den på avtalt sted, og han pakker den ut med en lett skjelving. Browning 9mm, 20 skudd. Den er tung, pakket inn i oljet stoff, lukter våpenolje. Kader øver seg på å lade magasinet, sette det i, ta ladegrep. Hver gang legger han sluttstykket mykt tilbake, intet skudd er løsnet. Ismail møter ham som avtalt. Tror vel at han er boss fortsatt. Det er lyse kvelder, de finner et halvmørkt sted bortenfor blokkene. Kader trekker Browningen og peker den mot magen til Ismail. Du bløffer – ikke kødd med meg, sier Ismail. Du ligger unna meg fra nå av, svarer Kader. Ismail går et skritt mot ham; han trykker instinktivt på avtrekkeren der fingeren ligger klar. Sikringen er av. Kulen kutter Ismails bukaorta tvers av, og han forblør på to-tre minutter.